Johnny Manziel reportedly was involved in a hotel fight in Cleveland over the weekend. A fan, who described himself to the first-year quarterback as “the biggest Browns fan ever,” apparently went up to Manziel and attempted to give him a hug. After that, he got punched by a member of Manziel’s entourage. The man who was punched was identified as 33-year-old Chris Gono, who has a lengthy police rap sheet. “There was no entourage. Johnny and his roommate were trying to get on the apartment elevator at his home when they were accosted by a very aggressive man and his associates. It was an unfortunate situation and he immediately let [Browns general manager] Ray Farmer and the team know what happened,” the statement reads, via ESPN. Brian Hoyer is in the midst of a rough patch, throwing six interceptions to three touchdowns over the past four games while completing only 53 percent of his passes. Coach Mike Pettine said that Hoyer, however, has displayed poise, namely in leading the Browns to a last-second field goal to beat the Falcons. “The way he handled it was outstanding,” Pettine said, via Cleveland.com. 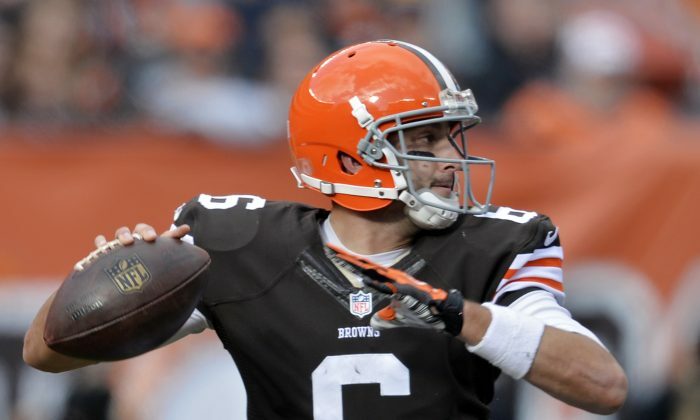 Pettine said he never considered benching Hoyer in favor of Manziel. Josh Gordon, who returned after a nine-game suspension against the Falcons, recalled telling Hoyer not to shy away from throwing to him on the final drive. “I just told him, ‘Don’t give up on me. Don’t quit on me,”’ said Gordon, according to SBNation. “It means the world to me to be back, but not just to be back, but to be with this team,” he added.